Trying to sort through my 365 Nights photos and workout what extra needs to be uploaded (a lot really). And I came across this photo I took of the closed BBNT (Burgers, Burritos, Nachos and Tacos) in Newtown. The store was a interesting concept, and it could have worked. But in my experience the service was lacking, food took a long time come. And when it arrived it was cold and parts not properly cooked. It seems that khemany had quite an experience at BBNT: No service from inept staff; delays in food preparation; that was cold and inedible when they finally got it. Trip Advisor has mixed reviews about the place, though it does note BBNT is closed. It is listed as one of the things in the Facebook What do you HATE about Newtown?. Alternatively, people at Sutekh seemed to think it was good. I found an interesting YouTube video about a BBNT experience. And the people at bellamyhayden seem to think their uneven closing time policy was a good marketing ploy. Of course, being uneven in other areas is what let them down. The inability to maintain quality control on food, and the lack of customer service seem to be the thing that did them in. 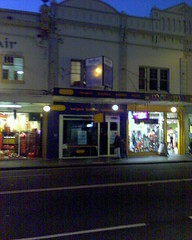 This entry was posted in Photos and tagged closed, food, Newtown, YouTube. Bookmark the permalink.